The Palm Beach Hotel is a three-star hotel located on the sea. 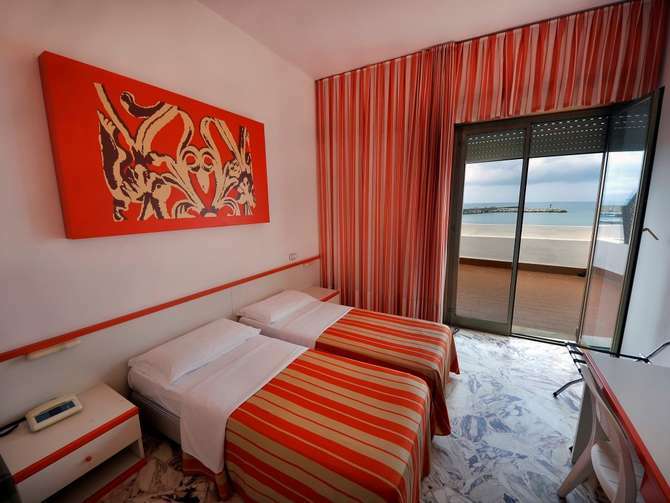 It is the ideal hotel for those who want to tour the western Sicily and dedicate themselves to a vacation of total relax or is in the area for work and is looking for a comfortable hotel with specific services. In fact, the Hotel offers a series of specialized services for the business traveler. The hotel has 40 spacious and bright rooms, furnished in Mediterranean style and equipped with all comforts: air conditioning, satellite color television, a minibar, a direct dial telephone, an Internet connection and a private bathroom with a hairdryer and complimentary toiletries. The rooms can accommodate from two to three people, with the possibility of a double bed or twin beds, and a third extra bed. Some rooms have a panoramic terrace. The hotel is just 7 km from the Palermo airport and can be reached by car in just 20 minutes, ensuring all types of national and international connections. The Palm Beach Hotel offers de reisaanbieder customers a transfer service to and from the airport 24 hours a day. The Hotel is located on the coast between Cinisi and Terrasini and the proximity of the port of Terrasini allows you to practice all the sea activities: windsurfing, sailing, underwater fishing.